Piazza Fontanella Borghese is one of Rome’s elegant living rooms tucked in between the Tiber and via del Corso. A gem of urban architecture, one side of the piazza is a façade of the imposing Palazzo Borghese where Napoleon’s sister Paolina once lived while another side holds the University of Rome’s School of Architecture. 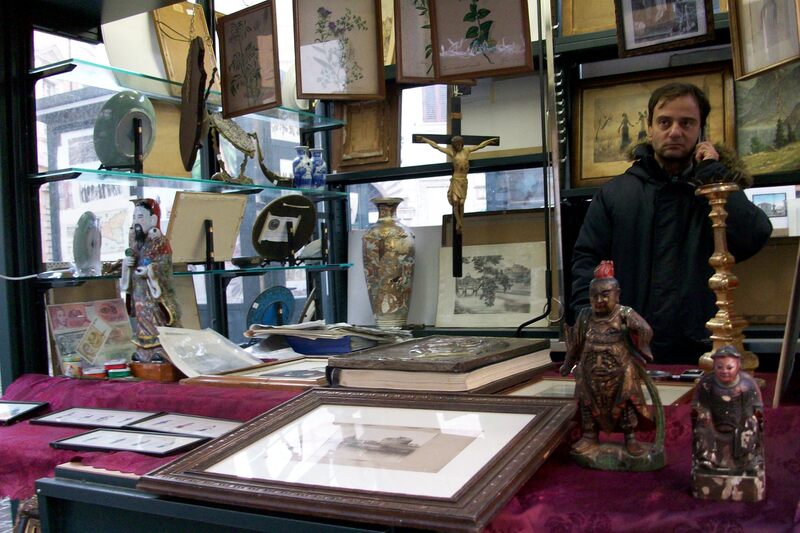 Since 1947 the Piazza has been home to a special market,(open every day except Sunday) where 20 small shops called box or edicola hold treasures for collectors of antique maps, etchings, posters, books ,photographs and cameras. 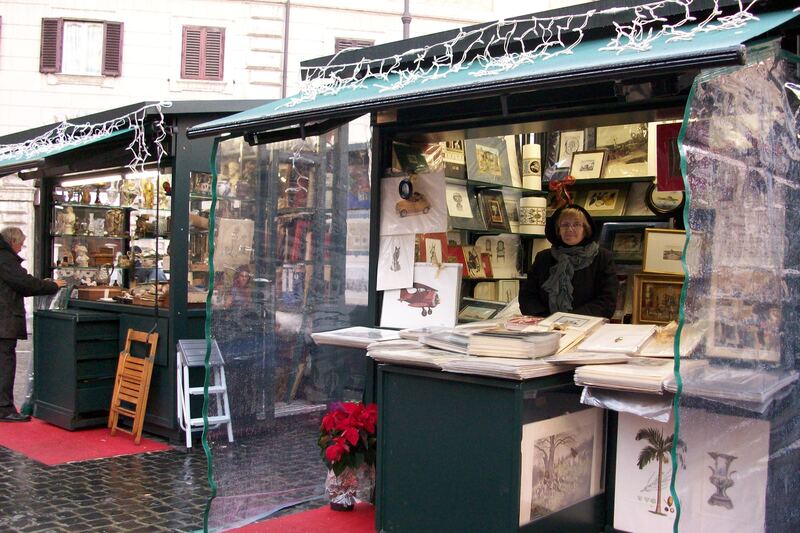 About half of the visitors are foreign tourists who, after having visited the expensive shops of the Piazza di Spagna neighborhood make a beeline straight down via Condotti to this quieter, more elegant but less expensive area. 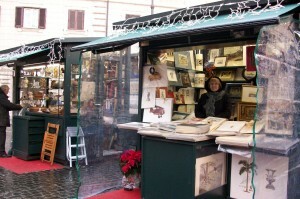 They know that Fontanella Borghese’s antique market holds those unique gifts, art objects and small antique items easy to pack in a suitcase. The stall owners who prefer to be called “dealers in minor antiques” have strictly controlled the licenses issued by the city to keep a small, fixed number of stalls. In the past couple of years the open carts have been replaced by glass enclosed stalls that protect the merchandise and are easier to heat in winter. 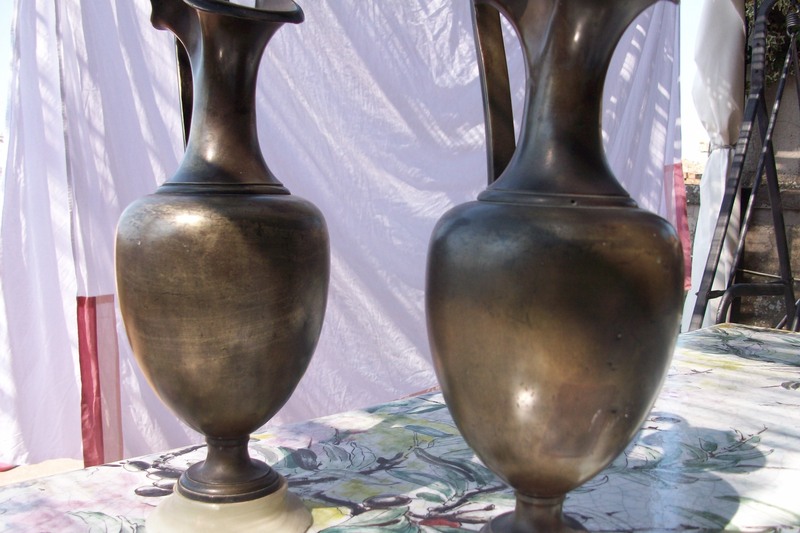 Here is a pair of bronze Etruscan style vases with alabaster bases found at the market several decades ago. 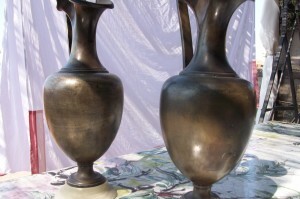 They were very affordable and increase in value each year. I particularly like the detail of Etruscan masks . 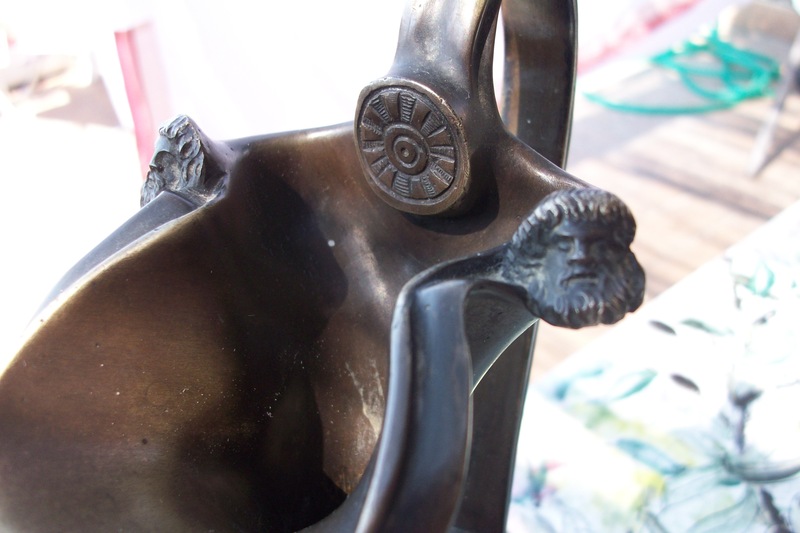 During the 1840s-70s with the first discoveries of Etruscan tombs and objects there was a boom in objects like these. The vendors are affable, knowledgeable and, after a very slow winter season, they are happy to chat, show off their merchandise and offer discounts to clients.